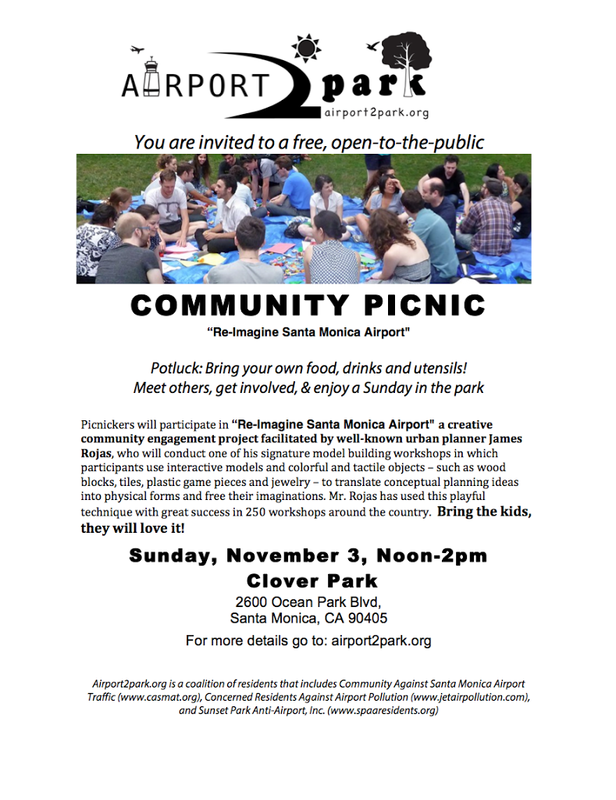 “Re-Imagine Santa Monica Airport” Community Picnic this Sunday at noon! 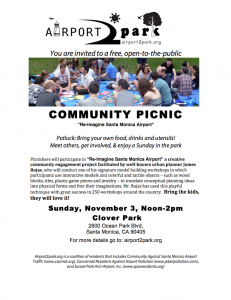 We are looking forward to seeing all of you this Sunday Nov.2 at Noon in Clover Park for an Airport2Park Community Picnic and “Re-Imagine Santa Monica Airport” a creative community engagement project facilitated urban planner James Rojas. This is potluck so bring your own food, drinks, utensils and blankets for a chance to meet other people who are interested in transforming Santa Monica Airport into a grand park for all. As you might have heard, the City of Santa Monica has filed a lawsuit against the FAA to resolve issues of control over the future use of the airport land. This is a major move by the city and if successful would move the city one step closer toward helping us realize our dream of a new park. We will have lots to talk about for sure. We will meet at 12:00pm, look for the Airport2Park banner and around 12:30pm we will have a few very brief words and then introduce you to James Rojas who will lead interested participants through a fun process that will help you envision what a park could be in order that we can further capture your ideas for what we can do here in Santa Monica to create a healthy, sustainable great park open for everyone. 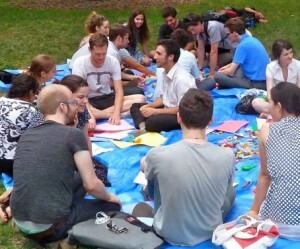 So come get involved and enjoy a Sunday in the Park and don’t forget to set your clocks back!